Jinan Zhuoheng Food Extrusion Machinery Co LTD has established more than 10 years and it is considered as China’s most experienced and reputable manufacturer of food extruder machines accessories and service. 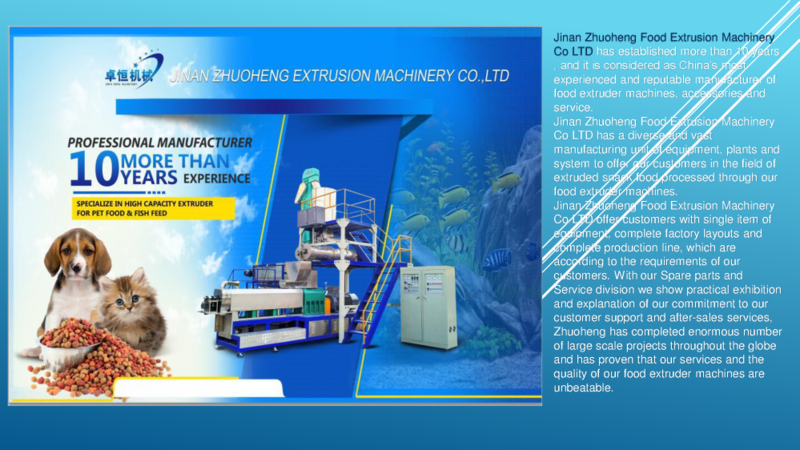 Jinan Zhuoheng Food Extrusion Machinery Co LTD has a diverse and vast manufacturing unit of equipment plants and system to offer our customers in the field of extruded snack food processed through our food extruder machines. Jinan Zhuoheng Food Extrusion Machinery Co LTD offer customers with single item of equipment complete factory layouts and complete production line which are according to the requirements of our customers. With our Spare parts and Service division we show practical exhibition and explanation of our commitment to our customer support and after-sales services Zhuoheng has completed enormous number of large scale projects throughout the globe and has proven that our services and the quality of our food extruder machines are unbeatable. BEST PET FOOD MACHINE IN CHINA0 CNZ Machinery is an established Pet Food Extruder and makes different kinds of machines for our distinguished customers. Distinguished by efficiency compendious design and high- production capability our machines are widely appreciated by the customers. By using these machines customers can easily standardize and personalize their production process and generate consistency among the quality of their offerings. Whether manufacturing or supplying in a batch process or in higher volumes through continuous methods our extrusion machines provide top-quality food products that are further batched and processed. This mainly the reason why we have become on the world’s leading Pet Food Extruder Manufacturers and our client network is expanding at a rapid speed.